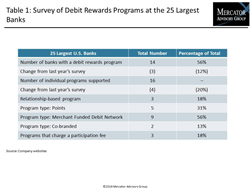 The market is showing greater reliance on merchant-funded discount networks (MFDNs), to defray the cost of rewards. Also, there is a slight shift toward relationship rewards which has some very practical opportunities. Decreases in checking account ownership as a result of competition from online-only banks and alternative financial providers, plus Millennials’ professed love for rewards have increased the importance of debit card rewards. Mercator Advisory Group’s latest research report, 2016 Annual U.S. Debit Rewards Review with U.K. Comparison, examines how the 50 largest banks and credit unions, plus the leading online-only banks in the U.S. are supporting rewards programs to help manage these market forces while balancing challenges with profitability. Members of Mercator Advisory Group’s Debit Advisory Service and Global Payments Advisory Service have access to these reports as well as the upcoming research for the year ahead, presentations, analyst access, and other membership benefits.